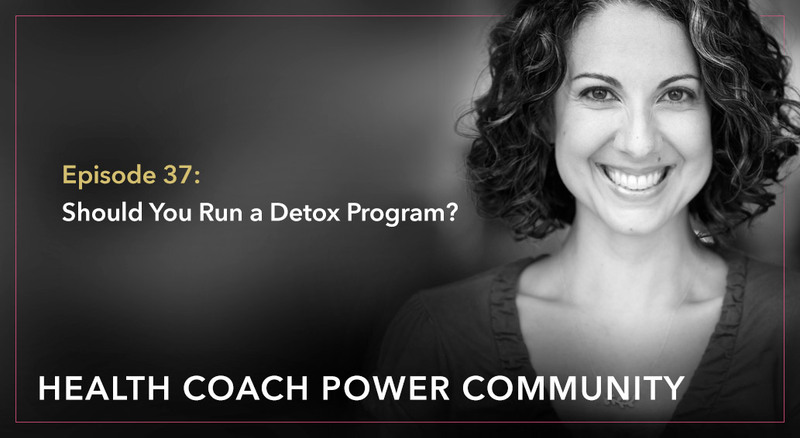 HCPC Ep37: Should You Run a Detox Program? – Her concept of a “so-called detox” and how to make sure you’re not contributing to a dieting mindset. – Staying within your scope of practice while running a group program. Okay, hello health coaches! Welcome to the Health Coach Power Community Q & A. My name is Michelle Pfennighaus. You know there’s a few key times a year when it is ideal to run a group program in your health coaching business. And we talked about this back in episode number 15 that there’s kind of a group program. Well, there’s two kinds. There’s a group program that’s basically 1-on-1 coaching that’s happening in a group setting. It’s more free form. It’s a small group environment, but it’s very similar to what you would do one on one or there’s what I call a detox style group program where everyone in the group is following or roughly following a set of guidelines and they’re sort of doing the same thing together. So today I want to talk about running a detox because we’re getting towards the end of 2018. I know it’s crazy and that means that it’s time to start thinking about January and January is one of those ideal times of year to run a program like this. So the question is, should you, is running a detox something that makes sense for you and your business and if so, how do you go about it? I have years and years of experience with this type of endeavor. So in today’s episode I’ll share what I know to help you get started planning something fun and something lucrative for the new year. How does that sound? Now, if you’re here with me live and we are streaming at healthcoachpowercommunity.com, go ahead and tell me in the comment area, have you ever participated in or have you ever run your own group detox program? You can just type yes or no. Now, of course, in order to run any successful program, the biggest prerequisite is that you have an audience to sell to. Now, preferably this audience is going to be your mailing list and we’re not going to talk about list building today, but never fear. I want to tell you all about my free training called how to double your mailing list in the next 90 days and you can sign up for that free training at findyourbalancehealth.com/double. It’s a very, very practical training. You’re gonna. Learn so much and walk away knowing exactly what you need to do from now through the end of the year. If you want to start 2019 with a bang again, you can sign up for that. Learn all about list building at findyourbalancehealth.com/double. Okay, so a few days ago in our facebook group I asked who had ever run a detox style program. A couple of people said that yes, they do these regularly with success. A bunch said that they haven’t done it yet, but they plan to in 2019, but the majority said no they haven’t. And the reason is that it feels too overwhelming, like they just don’t even know where to begin. And so that’s what I want to address today is that notion of where to begin. Let’s see who we have with us today. Sharon says, yes. I know Sharon has run detox programs in the past. Jennifer says, yes, she’s going to group detoxes. Alright, what about the rest of you guys? Is that a yes or is it a no? I’m going to talk a little bit about this idea of detoxing. There’s a huge industry of juice cleanses and boxed detox protocols and even real food detox programs, quote unquote, the term detox has become kind of a dietary fad and I’m not a big fan of that personally. I find that these things can easily become just another dieting mechanism for many of our clients. So what I say the word detox, I’m using the term colloquially, meaning like I said, it’s a group program where everyone is sort of following the same guidelines and moving through some sort of experience together. The actual term detoxification of course refers to a real process that happens inside your body and there are herbs and there are ways of eating and living that support that process. But by and large, anything we can offer as a health coach is not true. Detoxification, it is at most a step towards reducing our body burden. So I guess what I’m trying to say is I want you to think less about detoxing and more about what kinds of lead experience can I create for my clients. What’s something that we can do together so that at the end of five days, 10 days, 21 days, whatever it is, they feel great. They formed new healthy habits that they can continue. So here’s some examples. Let’s say your target market are women with autoimmune disease and many of them know that going off gluten would be an important step, but they’re too scared. It just seems too hard for them to go off gluten and therefore they haven’t done it. You might lead a five day gluten free experience where you help these women learn new ways of eating. You explore the gluten free products on the marketplace together and sort of navigate through making this big dietary change together. That might be your quote, detox, or um, let’s say your target market are millennials who are relying on sugar and coffee to get through the day because they struggle with energy. You could create a, let’s say 14 day experience where they ween off of coffee and sugar and replace those things with nutrient dense alternatives. You can help them get past the headaches, overcome their cravings, and that right there could be your so called detox. I liked that. I like that little term right there. My so called detox. So step number one is really determining what type of experience you can create for your target market in order to help solve their big problem. The next big things that you’re going to need to do are create a structure for the program and then market it to sell spots. So is this something that you should be doing? What do you guys think? Oh, Lori popped in. She said she’s never run a detox before. Here’s what I think for all of you out there, I think if you’re a new coach or if you’re anyone who needs exposure, running a group program like this can be a really great way to get that exposure. I mean, it’s almost like a glorified workshop. It’s a live event. It’s a reason to talk about your work and get people excited about taking care of themselves in a new way and seeing you as the expert. Lot of things going for it there. Now, if you need more clients and raise your hand if that’s you running a so called detox or cleanse is a great way to get to know people who will become future clients. I’ve had many participants of my groups go on to become private clients. Not all of them often. Not right away, but it does happen and they tend to be really, really great clients because they already know, like, and trust you and they know what you’re all about. So by the time they call you and they say, hey, you know, hey Michelle, I did your detox program three years ago, last year, whatever it is, and now I really think I could use some extra help. I mean they’re sold. There’s no closing the deal. There’s no any sales conversation whatsoever like they’re in. So it’s a really beautiful way to find perfect clients. And then if you need to reinvigorate your work or kind of re excite yourself about health coaching, sometimes we fall into a Rut. I don’t know if you’ve ever noticed that. I know it’s happened in my practice when that’s happening. A so called detox could be your best friend. These tend to be so much fun. You’ve got a group, you have all that group energy, you, everybody looking to you as an expert and it’s that community that I think the participants enjoyed the most. And I know I enjoy the most when I run a program like this. I always have a blast and it makes me think, yeah, this is why I’m doing this work. This is why I got into health coaching so I can change lives. And it just really inspires me and put some pep in my step again. So should you run a detox or a cleanse? Listen, if a lot of your clients have a history of chronic dieting, I want you to be really careful about how you’re positioning something like this. You don’t want to be offering. I’m assuming as a health coach, as a holistic practitioner, you don’t want to be offering just another diet or anything that could be misconstrued as such. And I’m totally guilty of doing this. In the past, I realized that while my intentions were good, I was not intending for anybody to join my program to lose a quick five or 10 pounds. The program was getting used that way. The participants were viewing it as sort of a weight loss, quick fix. And when I realized that I decided I am not doing this. I’m not going to contribute to diet culture. But if you can structure it in a way where you’re not talking about quick weight loss and you’re not claiming to detoxify or purify a person’s body, you’re really just creating a new eating and often living experience. For the sake of healthy habit change, I say go for it and please, please, please join us next Thursday, November first for a free training on exactly how you can make this happen easily and quickly. I’m going to drop the link right here in the comments or if you’re listening, you can go to findyourbalancehealth.com/cleanse. We’re going to be talking much more in depth, um, November first about what a detox or cleanse like program can do for your business. How to get started, even if you’ve never done anything like this before. So sign up to join us or we’ll send you the replay, of course, if you’ve registered at findyourbalancehealth.com/cleanse. Okay. So moving on to some other questions that I wanted to get to today. And by the way, anybody who’s here live, any questions you have related to your health coaching business, please just go ahead and pop them in the comments section and I will do my best to get to those in just a minute. So interestingly over the past week we got two really good questions that are sort of on the same topic, talking about MLMs and how they intersect with a health coaching business. So here’s the first one that came from Laurie. Laurie said, I’ve been educating my clients on essential oils and using them as great tools to help them with many issues. My struggle is that my oil involvement is with an MLM and I really don’t like the business side of it, just love the oils. I get constant pressure from my upline and I’m frustrated because I’m trying to build a health coaching business, not an oil business. The oils are just a piece of my wellness puzzle. So for anyone who’s not familiar with an MLM that stands for multilevel marketing, sometimes it’s called a pyramid scheme. There are nuances to this. There are some companies that will tell you up, down and sideways. They are not an MLM, but yet they still kind of are. It’s any of the companies where you join and you sell products on behalf of the company and then you get people on a team beneath you and you make a profit off of anything that they sell, it’s called your upline. The people who are ahead of you or above you in this sort of pyramid structure. Um, so what Laura is saying is that her upline is pressuring her to make sales and probably to onboard new recruits or whatever they’re called. Because that way everybody starts making more money. And Lori’s saying, I don’t want to do this. I don’t want to build the oil business. I want to build a health coaching business. So I’m not here to poop on MLMs. I know people who do them successfully and it’s working out really well for them. There’s no one right answer to this, but by and large, what I’ve seen through the years, Lori, is that I see health coaches who either focused on health coaching and they build their health coaching business. Or I see people who focus on selling essential oils, beauty counter, whatever it is, and they do that really well, but I don’t see a lot of people who do both well, they either focus on one or the other because they really are two different business models and although they seem complimentary, anyone I know who’s doing both, like I said, they’re not doing both well, so maybe they sell essential oils but not really. They just kind of order it for themselves through their own link or whatever. Maybe they occasionally will host a party and they’ll have some people that buy oils through them, but they’re making very little money that way. And they’re focusing mostly on health coaching or the opposite. Right. And so I think it’s just normal. It’s just like there’s only so many hours in the day and you have to choose where you’re going to put your energy. You can’t do everything at the same time. So if you’re really clear that you’re not into building an oil business, I would say, why don’t you just find your way out of that MLM and as you’re asking, uh, you know, find a different way of buying essential oils, high grade essential oils. And from what I understand, I have some friends who are highly trained aroma and herbalists. There are even better brands have these things available out there outside of an MLM structure. I personally do not get involved with any of the essential oil stuff that’s out there. Which brings me to my next question that came in from Melissa on the same topic. Melissa said, has anyone here been approached by consultants from international companies such as Arbonne or others like Isogenics to join them? I’ve been approached numerous times by what seems like good collaborations with coaches that have good intentions towards wellness, but I discover they tried to get me to sell the products too and it makes me really annoyed. I just want to collaborate with genuine coaches who are having small, authentic businesses like me not being involved with multilevel marketing. How do we protect ourselves against LLCs to prey on us, or how do we equip ourselves with better awareness? Yeah. Melissa, all the time. All the time. Again, not all MLMs are evil. They are not necessarily preying on us. There’s always going to be a few bad apples that spoil it for the bunch and those are probably the ones that we’re hearing from. If it is annoying. I’ve had people approach me in a very polite way and I’ve had people who were a lot more pushy. So, um, you know, it varies. I think that if we just put on like our common sense cap, there’s very few reasons for another health coach, essentially a competitor to reach out and try to form an alliance or create some sort of partnership with you if you’ve never met them before or if you’ve only met them in passing. And it’s almost like as if it’s too good to be true, it probably isn’t. And someone reaches out to me, he’s like, Hey Michelle, it’s a good opportunity. You know, I’m really into wellness and they say you are too my bs meter goes off immediately. So I think it’s safe to say that nine times out of 10, any opportunity like that is not really what you’re hoping it is. It is someone trying to sell you something and it’s not necessarily an MLM. I’ve had people approach me about, you know, paying them to do some sort of pr for me, a SEO from my website now, all kinds of ways that people are just trying to get me to help them make money. So you get attuned to this after a while and sometimes, hey you, you do need that kind of help or you do want to get involved with selling such and such. And so it’s great that they’ve reached out and contacted you. But I would say almost every single time it’s happened to me, it’s a big fat. No, no, thank you. So oftentimes I don’t reply to any sort of request like that, but if I do, if it’s a little unclear and I want to know more what it’s all about, and this is what I would suggest that you do, is just ask this very straightforward, is this an MLM opportunity or is this involves selling products? Just ask them right off the bat and I will go a step further and let them know, you know, thank you so much for reaching out to me. Is this about MLMs I ask because MLMs and selling products are not part of my business model period. End of story. You don’t have to apologize for it. You don’t have to make any further excuses. You can simply say, that’s not part of my business model. Goodbye. And that’s all they need to know and then he’s. But anyone who pushes beyond that is wasting their time. So Melissa, I’m sorry that this has become an annoyance for you. It is sort of part of being in the field and in some ways take it as a compliment. It means you’ve made it to a certain degree because people are looking for health coaches that have an audience and people to sell to, and if you weren’t coming across as someone with some level of success, they probably wouldn’t bother with you. I hope that helps. Let’s see. Erin’s asking. Hi, can you speak to scope of practice? What should we keep in mind as health coaches running a cleanse? Oh, that’s a good question Erin. So generally anything that’s done in a group setting is a bit safer than anything you’re doing one on one because if I say to a group like, okay, this week we’re going to be cutting back our sugar consumption by half, you know, do the best you can ask me any questions. Um, it’s different than telling an individual something prescriptive. Like, I want you, Aaron, to cut your sugar consumption down by 50 percent when it’s in a group setting. It is more informational and optional to join in. So, and that will happen. You will have people who will do exactly what you’re suggesting and you will have other people who don’t for any number of reasons follow along, um, but you do still always want to frame everything as a suggestion or a guideline, never a prescription or rule people like to use the word rule because they are very used to dieting. So I’ll have participants say like, I know I’m not following the rules, but Lauren, Michelle, can you remind you what the rules are around and I always will reframe that as these are not rules, but this is the information I’m sharing with you and you get to decide what you’re going to do with that information. Um, and, and so this just is across the board as health coaches. We always want to be careful with our languaging around these things outside of that era. And I can think of a lot of ways that you could get going outside your scope of practice and with having people take different herbs or supplements. Again, you want to make sure all of these things are suggested for informational purposes only. And I’ll often have a disclaimer like that on the first page of anything that I send out that says something like this, I am not a doctor, and you see this all the time and books, even books that are written by doctors or um, programs within, by licensed professional little still say something like this material is for informational purposes only. You’ve seen that, right? Because you don’t know who you’re dealing with, you don’t know you’re not doing a full health history with everybody who comes through your door. You could, it could be someone who’s going through cancer treatment, you know, and it may not be appropriate for them. So another thing that you always want to repeat, say often a and put in your disclaimer or something like ask your doctor, I’ve always encouraged my participants to run this program by your doctor before we begin. And if there are any concerns whatsoever, I will refund all your money right away. I’ve never had that happen. But that’s something that you can say right off the bat to kind of see why. So that’s kind of the basics. Beyond that, you just want to make sure that everybody knows that the guidelines are optional. Any meal meal plans or recipes that you provide are for suggestion only. Sometimes I’ll say there are for illustrative purposes only, meaning this is the type of meal that you might eat and leave it at that most people are not going to follow every single meal in the meal plan. Do exactly what you say, but you never know and you wouldn’t want somebody to then turn around and tell you that what you did caused a problem for them. So it’s always has to be their choice that they’re taking on these options. Sandra says, I always suggest checking what their doctor, but do you have to make sure they do because I don’t think people actually ask their doctors that’s on them. I think putting it out there is sufficient and I’m going to stop talking about it here because I’m not a lawyer and I don’t want you to take any of this as hard and fast legal advice. Lisa Fraley is really the person to contact with any true legal questions and I believe you can book her even for just a half an hour for like a couple of hundred dollars and ask all of these questions and get the perfect answers, but in the past what I have always done is just been very open about the fact that this is for informational purposes only. Please talk to your daughter. Hope that helps. Good question. So I mean I think that everyone should be thinking about things like this and being careful that what we pulled together is not going to land us into some problems. And you also never know. I’ll share a story from years ago now, 2010. It’s probably the first. It was the very first program like this I ever ran and one of the guidelines was to eat some form of leafy green vegetables every day. I mean what could be more benign than that? And there was a list of all the different types of dark leafy green vegetables and it recipes with all different ways of preparing them. It was in no way prescriptive as to exactly how much or exactly which ones to eat. And at the end of the program, one of the participants, um, contacted me very, very angry because her husband who was not even enrolled in the program I didn’t even know he was participating, ended up in the hospital with kidney stones and the doctors told him that it was likely because he had been eating Broccoli everyday for the past couple of weeks. So they turned around to me to let me know what my program had done to this poor man. That was very difficult for me as a brand new coach and I had to let them know that number one, this man was not enrolled or registered and not even part of the program. So really outside anything that I could’ve possibly known about or done anything about. Number two, Broccoli is not high in oxalates. Like other dark, leafy green vegetables. So if any dark, leafy green vegetable everyday was going to cause kidney stones. Broccoli would not be it. I also had to let them know that a man of his age is of high risk for kidney stones and they have probably been developing for years and years and years and just coincidentally came to a head during this time period and beyond that ways to reduce your risk of kidney stones is eating less red meat, drinking a lot of water, all things that we had been doing during the program, so if anything, the program is probably going to help him. Unfortunately that is when these kidney stones decided to show up, but that was enough for me to start putting more disclaimers into my work and making sure that people are taking personal responsibility for their actions. All right. Any other questions from you guys who are here live? I have about four minutes left and I have one here from Marissa. Marissa said I’m working on a back on track program for the holidays. Yay for planning ahead and I’m pricing it as a really good deal. My question is, when you’re offering a deal, do you find it more enticing to just state the price or to state the price as well as the value of the package? I would be interested in your view from experience as a health coach, marketing yourself or as a consumer. So I think we’ve all seen this, right? You go to buy something and it’s like a, you know, like $2.99 which like a slash through it and then you see $0.99 or you say like $99 valued at, you know, $300. So it’s supposed to be a way of people really seeing that value, knowing that they’re getting a good deal on something, I think you run the risk of being kind of cheesy doing this. Um, and so Marissa, what I would ask you is, is the value of what you’re giving them a fixed true value. So here’s an example. Like if I’m gonna I dunno if I’m gonna buy this phone, this phone costs, what is the phone cost anymore? Like $800. It’s ridiculous. This phone costs $800. It literally cost $800 any day that I walk into the store, so if they’re having a sale and the phone on sale for like $600, they could say value $800. That seems very straightforward and also worth knowing as a consumer. But where it gets tricky with like information products and coaching is that if you’re putting together this program for the holidays, it’s not like you normally offer this exact same program for a different price. I’m assuming, you know, you offered bits and pieces of it so it’s very hard to figure out exactly what it’s worth. If I hired you privately to do this type of work will. That would be one on one. This is going to be group. It’s really hard to come up with the value of these things. How much is a meal plan worth? How much are you know, is your Facebook group worth? It’s very hard to like itemize it out and a lot of times when you see this stuff and I’m sure you have in a Webinar or somebody trying to sell you some sort of information product, it is like, you know, you’re going to get this, you’re going to get that and it’s like $400 valued at like $4,000 and you think to yourself really, really isn’t worth $4,000. So I think I would just be careful that you’re being authentic and how your pricing and how you’re calculating value and how you’re showing that difference if at all, and if you are just creating a low cost program to make it accessible and it’s something that people can just say yes to without having to think too hard about it for the holidays. That could be enough just to say, Hey, it’s $97. We’re trying to provide the value behind it. Um, so that’s how I would go about thinking about that. Okay. You guys, I don’t see any other questions for today. I hope you’re all having a fantastic week and keep asking great questions in the group. And we’ll be back next week to discuss them. And once again I want to remind you to go ahead and sign up for next week’s free training, about more nuts and bolts on how to run a detox or cleanse the URL. To do that is find your balance health.com/cleanse. And I’ll see you then. Have a great week. Everyone. Take care.